There’s been enough confusion on this topic to warrant its own post, rather than another addition to the FAQ. So, here follows a few answers on topics relating to availability of the book. One quick but necessary caveat first, however. As the author, I have little control over publishing schedules or plans. Those are determined exclusively by the publisher – O’Reilly, in this case. So if you’re unhappy with some of the changes – the delayed Amazon availability, for example – please accept my apologies, but understand that it’s not within in my control. Q: Where can I get the book right now? Click the link there, and you’re off to the races. Q: What format does the book arrive in? A: The download is a PDF. Q: What if want to read it via my Kindle app, like the rest of my books? A: The Kindle app will actually display PDFs natively. Alternatively, you can import PDFs into your Kindle library using Amazon’s “Personal Documents Service” – see the instructions here. 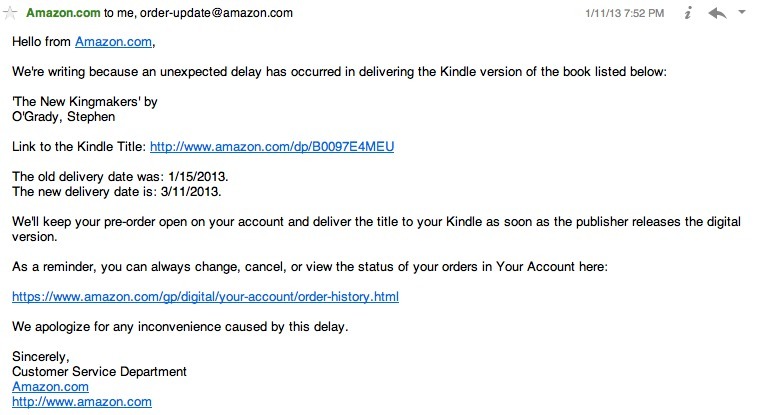 Q: A few days ago, there was a link to the book on Amazon and I ordered it with an availability date of 1/15. Then I got an email from Amazon saying that it wouldn’t be available until March, and the book is no longer available on Amazon. What gives? A: The short answer to this question is: “I don’t know.” The longer version is that I’m unable to answer as I’m not sure exactly what happened behind the scenes. 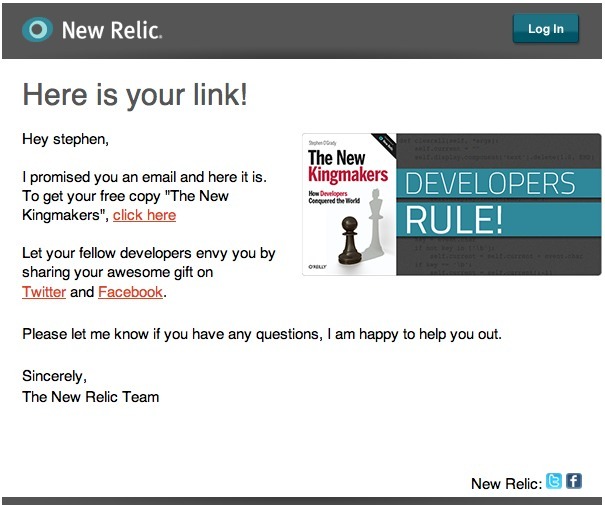 For the record, I got the same email (see inset) . Best guess is that it got posted to Amazon early by accident or something similar. In the meantime, you can get the book from New Relic for free, and it will – barring any more unforeseen complications – be available on Amazon and elsewhere without restriction in two months. Q: What about other non-Amazon marketplaces (e.g. B&N) or formats (e.g. EPUB)? A: My understanding is that O’Reilly will make the book available in a variety of marketplaces and formats, and likely one compatible with your needs. That addresses the bulk of the questions I’ve received so far. If there are any that I missed, feel free to contact me with any questions.